A go-to guide on responsible tourism. Ecotourism is a growing travel trend that can be a win-win situation for countries with limited resources and tourists looking for a vacation with animals. By providing employment and professional opportunities to people living in developing nations, ecotourism also incentivizes governments to protect their remaining wildlife. From backpacking treks to more comfortable resorts, there are multiple options for different incomes and styles. For a few PASA member sanctuaries, tourism can be a much-needed source of income and a great educational opportunity for visitors to see rescued animals that are unable to return to the wild. Through this approach, non-releasable rescues become ambassadors for their wild counterparts and give visitors a chance to get answers from informed professionals. However, what about organizations with less noble motivations? Here we discuss how to locate responsible opportunities that support and don’t harm wildlife. 1) Does the facility advertise photo opportunities and contact with wildlife? In developing countries, travelers are likely to encounter opportunities to get their photo taken with a variety of animals such as monkeys, baby chimpanzees, or even tigers. Sometimes the opportunity is simply a single person on the side of the road with a monkey on a leash. Large facilities also capitalize on this money-grab, such as the infamous “tiger temples” of Thailand. In many cases, these animals were taken from the wild as infants and raised to be manageable. In the case of primates, the mother and multiple adults in the social group may have died trying to protect the infant. If not wild-caught, animals may have been bred in captivity solely for posing for photographs. Besides the serious welfare concerns, this practice implies that wild animals are easily handled and can be pets. Imagery that promotes this notion is very dangerous for animal populations that are already heavily threatened by the illegal pet trade, such as chimpanzees and orangutans. Additionally, handling primates can be very risky. Without the appropriate medical gear, vaccinations, and training, both humans and animals can transmit diseases and parasites, or accidentally injure each other. 2) If the organization claims to rescue orphans, where are they rescued from and what is the end goal? 3) On websites or hand-outs, is there a clear message of conservation? Is the facility accredited by a reputable organization? In many places, for legal or logistical reasons, it is not possible for sanctuaries to return animals to the wild. If a facility claims to be a haven for wildlife with no other alternative, check to see if they are sponsored by a reputable organization, like PASA or GFAS, that can vouch for their practices. Ask yourself: Are the people representing the organization aware of the threats to wild animals, and how is the facility working to solve the problem? 4) Are social animals housed individually or in groups? While there are exceptions to this rule, if animals that are found in the wild in social groups are being kept alone, this may be a red flag. Primates are a great example of this. Humans are not a long-term solution for companionship for species of monkeys and apes. Some exceptions to this would be for individuals that are geriatric or have medical conditions that do not allow them to hold their ground well in a social setting. When looking for a travel experience that includes animals, seek out reputable organizations with the credentials to back-up their work. If you choose to visit a sanctuary in Africa, check to see if they are one of PASA’s 23 accredited member organizations, or if they are a member of the Global Federation of Animal Sanctuaries. Please check-out pasaprimates.org/rescue-and-care-for-wildlife/ to learn about the many primates that have found refuge at a sanctuary with PASA’s help and to see how you can help PASA continue doing this important work! From Instagram.com/celinayoo86. 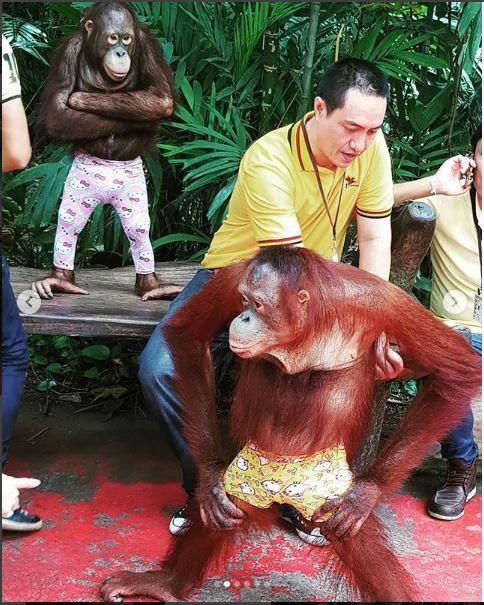 Orangutans are used in unethical tourist attractions throughout Asia. #Cruelnotcute! 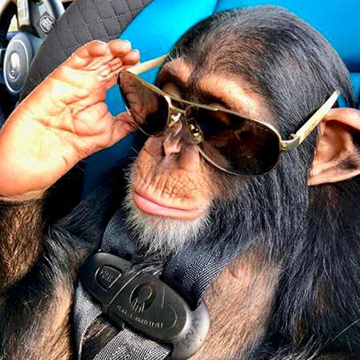 This baby chimp is regularly used for photo ops with tourists. Photo from Instagram/limbanizwf. 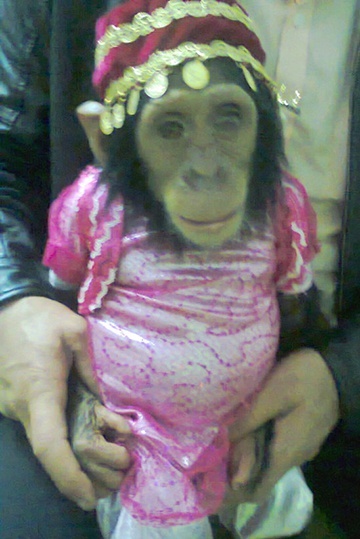 Manno the chimpanzee was used as a tourist attraction in Iraq before he was rescued and brought to sanctuary.